Give a favor your guests can use, our Perfectly Plain Collection Wine Bottle Stoppers are a fun way to add your own style to your favors! We've left the top of the bottle stoppers blank so you may decorate them anyway you choose as an extra-special gift your guests will appreciate. The chrome plated silver metal stopper features a black rubber gasket wrapped conical base for a tight seal. The wine bottle stoppers come packaged nicely in a clear topped box with a black base and is finished with a white organza bow. And just because these are cheap wine stoppers, it doesn't mean they look cheap!Each measures 3.75" x 1". For the version of this stopper that offers a personalized label, please search 6713ST. Can the disk be taken off? 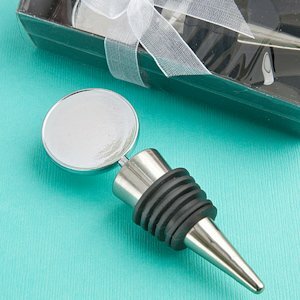 The round top of this Perfectly Plain Collection Wine Bottle Stopper Favor is attached to the stopper. Also, the chrome plated silver metal stopper features a black rubber gasket wrapped conical base for a tight seal. How do I customize the stopper. This is the plain version and does not offer any customization. You can click here to find the personalized version.